Today we celebrated my son’s 6th birthday with a few of his friends. He chose the theme for his party…Lightening McQueen from the Cars movie. I wasn’t terribly surprised about this because he loves those little cars but I was a touch disappointed because I had a hard time thinking of crafty ideas to go along with it! For the invitations and party bags, we drove matchboxes through paint and rolled them onto the cards and bags. 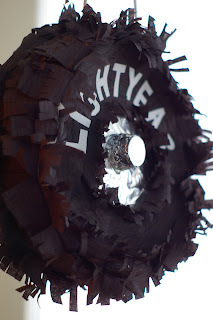 Then we embellished with Cars stickers and the kids’ names in a neat tire tread font we found online. At my son’s request, the cake pictured a scene from the movie where Sheriff was chasing Lightening McQueen through Radiator Springs. I made cacti from spearmint leaves and toothpicks, the sand was made from graham crackers and the road from chocolate graham crackers. With the help of my husband, we constructed a simple racetrack. It was two pieces of wood with holes drilled in them to hold checkered flags. I bought checkered flag material and used my hemming presser foot to hem them and attached them with hot glue to the dowels. The finish line was a piece of the checkered material. 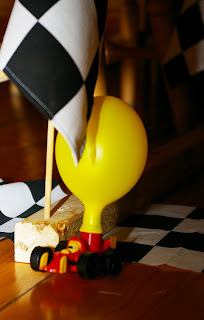 The kids raced balloon powered cars and the winner won the “Piston Cup” which I constructed out of a paper cup and corrugated cardboard and spray painted gold. Much to my delight, it was a coveted prize! Each child could keep their racer and a checkered flag. After we opened gifts, we headed out to the barn for a pinata. We were tired of store bought pinatas that wouldn’t break no matter how hard they were hit so I made my own. 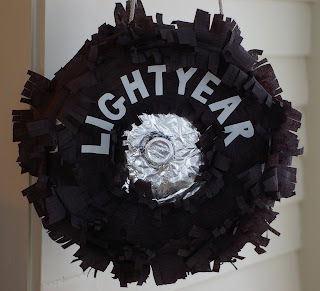 It is supposed to be a Lightyear tire. It actually worked well. Each child had two turns but on their last turn, things were flying out of the pinata.